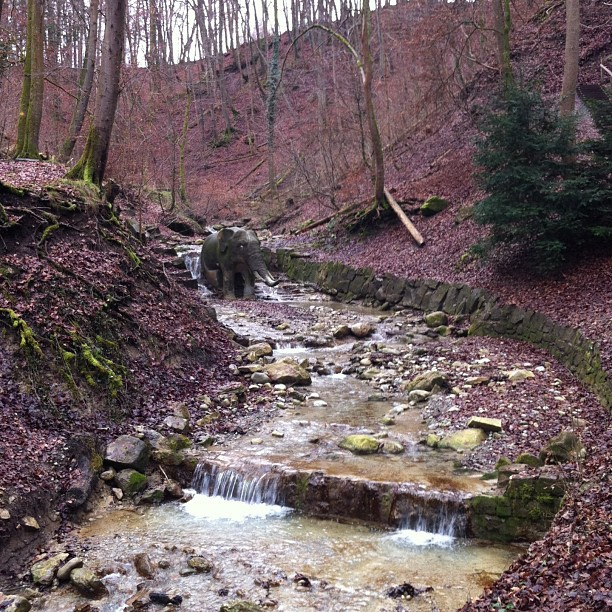 The one in the Elefantenbach, a pathway almost outside Zurich’s city limits. If you look really close, you will see a stream of water coming out of Dschumbo’s trunk. Nobody really seems to be able to offer an explanation either for this concrete elephant or the name of this alley, even. Apparently, it was built in 1898 to commemorate Napoleon’s defeat, along side the picnic area. However, this cree was already called Elefantbach before the statue was put there. Legend might be more helpful to explain all this: it seems one of Hannibal’s elephants stopped here and refused to continue. To put it out of its misery, it was then transformed into stone. A big thank you to B., M., and K., for reminding about this blog and sending the picture… It is not everyday you bump into a fountain with the shape of an elephant.